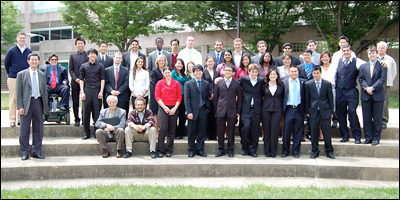 The Class of May 2008 with Professor Yang Tao (far right). 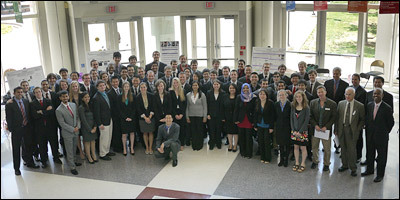 Bioengineering students majoring in Biological Resources Engineering gathered for the presentation of the projects that represented the completion of their undergraduate experience at the Capstone II finale, held May 14, 2008. Seniors presented the results of their research and testing, outlined challenges and successes, and demonstrated their prototypes. 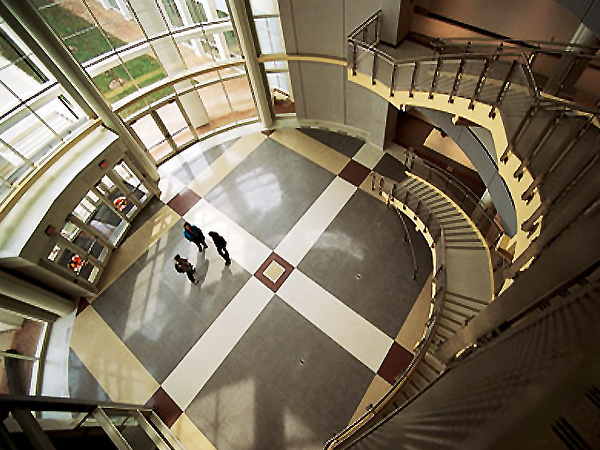 Capstone, a two-part course taken in the fall and spring semesters of senior year, is one of the most important parts of the Clark School's engineering program. In it, teams of students utilize what they have learned throughout their undergraduate studies to create their own engineering designs from concept to product. Our seniors would like to thank their mentors (listed with their Capstone teams below); lab staff including Melvin Hill, Ali Jamshidi, and Gary Seibel for guidance, time, and labor; Professor Hubert Montas, who assisted several teams with integrating his microcontroller-based smart software/hardware system with their projects; administrative staff members Sandra Huskamp and Karen Lasher for help with financial support and purchasing; Professor and Fischell Department of Bioengineering Chair William Bentley; and friends in outside academia and industry for the advice and supplies they donated that helped these projects succeed. Mentors: Professor Adel Shirmohammadi and Domenick Coletti, M.D., D.D.S. Team 1 worked with both their faculty mentor and Dr. Domenick Coletti, M.D., D.D.S., Assistant Professor of Oral-Maxillofacial Surgery at University of Maryland School of Medicine, to design better measuring tools for use in mandibular reconstruction, in which the patient's jaw is rebuilt using pieces of bone taken from their arms or elsewhere in the body. This long and difficult operation requires the surgeon to take measurements from the patient and transcribe them onto the piece of donor bone in order to achieve the best match between the jaw and the graft. The group created a system that included a three-dimensional ruler that allows surgeons to analyze a plastic model of the patient's injury in order to visualize a reconstruction strategy, a means to convert 3D data to a 2D format, and a measurement transfer device that scribes measurements taken by the 3D and 2D measuring tools onto the bone graft prior to excision. The group also discussed how their tools could be economically manufactured to be disposable and shipped in sterile packaging. Team members are hoping to continue their work with Dr. Coletti, and are considering pursuing a patent and publication of their results. While prosthetic limbs are becoming more and more advanced, Team 2 explained, there are currently no transradial myoelectric (controlled by impulses from the arm muscles) hands on the market capable of opening, closing, and rotating clockwise and counterclockwise without switching modes or using a manual control. Using a prosthetic hand lent to them by Prosthetic Orthotic Solutions International, they set out to create a control system sensitive enough to interpret signals generated by the extensor and flexor muscles of the forearm for all four actions. The group developed their own signal processing technique for the hand, including filtering, smoothing and amplifying, while maintaining minimal lag time in response. To demonstrate the modified hand, a group member placed EMG (electromyographic) pickups on his right arm's extensor and flexor muscles, and, holding the prosthetic hand in his left, used it to pick up a bottle of water, rotate it clockwise to pour a drink, rotate it counterclockwise to stop, and let go of it once it had been set down. We typically assume that the water that comes out of our taps is safe to drink, even if it may not have the best taste. Most of us are supplied by large reservoirs or other systems that include treatment facilities to ensure water safety. However, few regulations exist for the management of private wells: in Maryland, testing is only required when they are originally drilled or when a house is sold. Nitrates—byproducts of fertilizer, landscaping, septic tanks, and other sources—can find their way into a private well, causing corrosion of pipes, stimulating the growth of bacteria, and posing a danger to those who drink the water, particularly infants. Team 3's goal was to design a battery-operated device "small enough to sit on a kitchen counter" and easy enough to use by homeowners to routinely test their well water's pH and nitrate levels with an accuracy of +/- 5%. In addition to warning the user of contamination, the device could also log test results over time. Their prototype featured a water sample container, electrodes, and a custom-built computer with an LCD display. They envision the consumer version as being an all-in-one unit with a faucet hookup, making the testing process almost hands-free for the user. UVA and UVB radiation are well-known to cause sunburn, cataracts, and skin cancer. Using sunscreen lotion helps, but we often forget to reapply it, or miscalculate how long it will last. Although babies and the elderly are more at risk, existing products made to protect us—both sunscreen and devices—do not take age into account. Team 4's goal was to design a device that could not only tell people when they were in danger of overexposure, but better adapt to the needs of an individual. Noting that current devices on the market are slow, bulky, and not entirely accurate, the team created a device called the Ultraviolet Monitoring Sensor Wristband (UVMSW) that would encourage everyday use: its components would be small enough to be packaged in an arm- or wristband, and it features an LCD display with simple controls and clear feedback. The team developed an equation the device uses to calculate its wearer's daily safe amount of UV exposure based on their skin type, age, and the SPF rating of his or her sunscreen (if applied). After the user enters this data by answering a simple set of questions on the LCD screen, the UVMSW goes to work, sampling ambient UV radiation every 5 seconds. The screen displays a happy, neutral or frowning face in different colors to indicate the level of exposure, as well as the amount of time left in the day the user can safely remain in the sun, and audio and vibrating alerts. Accrued data can be downloaded to a PC in order to track exposure over longer periods of time. Poor blood circulation resulting from injury, illness or prolonged periods of remaining in the same position can lead to chronic wounds, pain, edema (fluid buildup) and even amputation of limbs. Vibration therapy has been shown to increase blood circulation, oxygen consumption, and tissue healing; reduce edema; and improve sensation and balance by stimulating neurons. Team 5's objective was to design an easy-to-use, comfortable, wearable medical device capable of providing vibration therapy to the feet, even while the user is wearing shoes. The team's prototype consisted of vibrating motors embedded in a protective insole, connected to a power source on a soft fabric strap worn on the patient's ankle. They tested it on themselves using a pulse oximeter, a device that indirectly measures the oxygen saturation of hemoglobin based on the color of the blood it "sees" when a light is shined through a patch of skin. The team found saturated oxygen levels increased to 100% while wearing the sandal-like prototype. The team also worked on adding a microcontroller and USB connector that would allow the vibrating motors' activity cycle to be programmed by a computer. "Green" buildings designed to incorporate vegetation save energy in the summer as their plants absorb heat. While the concept is increasingly popular, its execution is difficult if not impossible for most: the cost of maintenance is high, and buildings not originally designed as "green" must be renovated in order to bear the extra weight. Team 6 proposed a more affordable solution that would work with existing architecture in Maryland. Their objectives were to design an easily installed "green cloak" applied to windows rather than roofs, with an automatic irrigation system, wastewater management, and aesthetic appeal. To create their cloak, the team chose the River Bank Grape—a hardy, flowering vine native to much of the United States and Canada—to plant in a box-and-trestle unit made to be installed around windows. The planter units were equipped with drip irrigation and moisture sensors in the soil that communicate to a microcontroller programmed to activate or shut off a water pump if conditions are too dry or moist enough. Although battery-operated for the demonstration, the team described how solar panels could be integrated into the system for additional energy conservation. Team 7 hopes to make things easier for first responders in mass casualty situations. The START (Simple Triage And Rapid Treatment) system currently in use sorts patients by assigning them a colored tag after medical personnel perform a brief assessment of their injuries. Team 7's concept is to provide an additional tool that can monitor pulse and blood oxygen saturation, be seen from a distance, be applied by non-medical volunteers, and communicate a change in patient status. The prototype device demonstrated gently clips to a fingertip or ear lobe, where it then begins to monitor the patient. One LED on the device blinks in time with the pulse, while another signals a drop in oxygen level in the blood by using pulse oximetry. 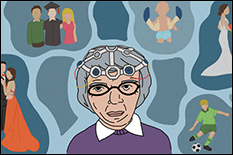 In addition to providing a fast, basic visual indication of the patient's condition, the team also designed a means of processing and conditioning signals from the device that could be converted to displayed data for further analysis. Drug-eluting stents are those that, in addition to opening a coronary artery, also help keep the path clear by releasing a drug that blocks future cell proliferation in the area. This is an important enhancement that can prevent new clots, fibrosis, and the re-closing of the artery (restenosis). 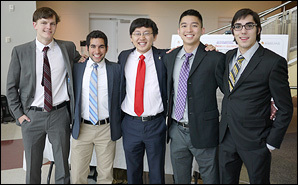 Team 8 sought to improve on existing products by increasing shelf life of drug-eluting stents, making them more biocompatible, and extending the amount of time the drugs can be released to 30 days. To accomplish this, they designed a homogenous, nanoporous coating for the outer surface of a stent, capable of withstanding the forces associated with its natural expansion and contraction. The group used electrochemical polymerization to deposit the coating evenly on a test stent, demonstrating through the use of illustrations and scanning electron microscopy images how their coating formed over time and with alterations to other variables. 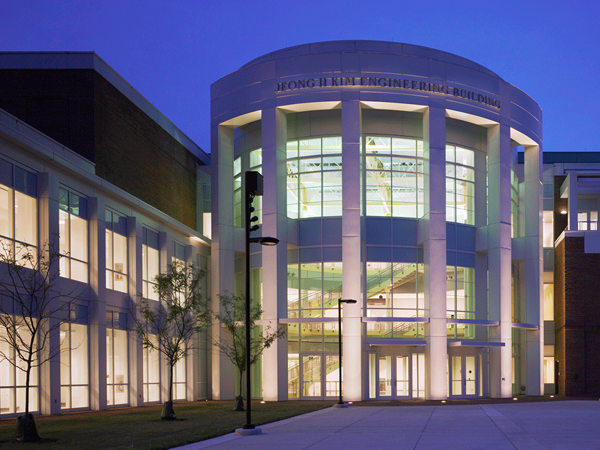 Team 8 was inspired to work on this particular project after department benefactor Dr. Robert E. Fischell (M.S. 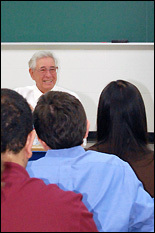 '53) gave a talk on the subject to the Capstone class. Dr. Fischell, who is often described as the father of modern medical stents, served as one of the team's mentors and provided financial support for their research. The team hopes to continue developing their product with his continued support and input. We wish all of our seniors the best! We’re sure innovative engineers like these will succeed wherever they go.